Nintendo and Sega. Hardware rivals for decades, and even today they remain the archetype Japanese video game companies. Only, Sega isn't entirely Japanese. It was founded by some American guys. While Nintendo, with its history in trading cards and love hotels, is as Japanese as they come, Sega's history can actually be traced back to two companies and four men, who saw an opportunity to make a buck from American forces serving in occupied Japan. What follows is not a complete history of Sega itself; just that of its origins as a pair of American companies pioneering amusement machine entertainment in Japan. In 1940, just prior to America's involvement in the Second World War, three businessmen - Martin Bromley(who was actually at Pearl Harbour when the Japanese attacked on December 7, 1941), Irving Bromberg, and James Humpert - formed a company called Standard Games, which was located in Hawaii. The idea was that, with war on the horizon, there would be a lot of men on military bases, and those men would need something to kill their spare time with. So Standard Games sold coin-operated amusement machines (mostly slot machines) to these bases. After the war, and especially given the fact Japan was now under Allied occupation, Standard Games' (which was now known as Service Games thanks to its military focus) saw a massive opportunity with the number of relatively idle American personnel stationed in Japan. Its US-based business was also under attack from state governments seeking to outlaw coin-operated gambling machines. So in 1951 the company upped sticks and moved to Tokyo. A year later, the company changed its name again, to Service Games of Japan. The move to Japan saw the company's focus change; while initially only selling machines to US military bases, Service Games of Japan quickly found a market with private Japanese consumers and businesses as well. Meanwhile in 1954, another Japan-based amusement company run by an American (David Rosen) was founded. 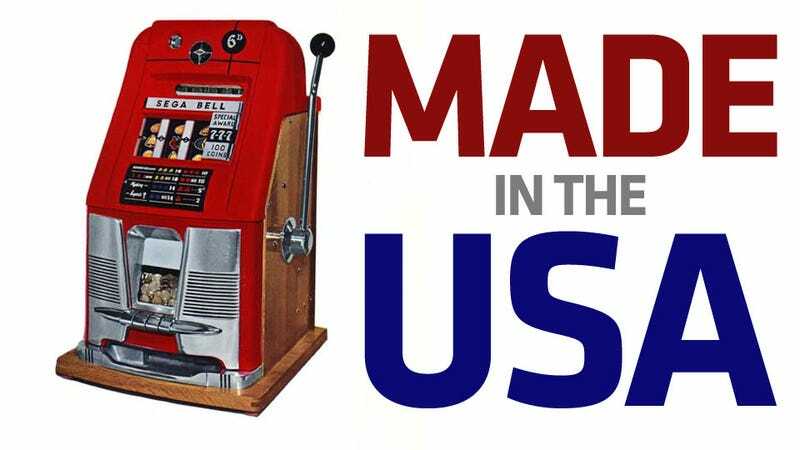 Rosen Enterprises' speciality was importing photo booth machines from America, which led the company to expand its business to later include coin-op machines as well. In 1965, seeing the advantages to be had in pooling their resources in a booming market, these two businesses would merge. The resulting company would thus be known as Sega (a shortening of Service Games) Enterprises. In 1966, Sega released its first arcade game: Periscope. Appearing before electronic arcade games were invented, Periscope was a submarine battle game which was operated mechanically. Your targets were small plastic ships, and the player's torpedo attacks were illuminated on the game "screen" by flashing light bulbs. Periscope was a hit, so much so that machines were sold and shipped to America, and it set Sega on a path of electronic arcade gaming it's still on to this day. Yet it was also a catalyst for the end of the unique and sole American ownership of the company. In 1969, giant corporation Gulf+Western purchased Sega. While they presided over a continued enlargement of Sega's business (including Sega's first home console, the SG-1000), by the time of the video game market crash of 1983, the now gaming-focused company was in dire straits, and was split in two by its owners. Its American components were sold off to pinball company Bally, while the Japanese side of the business was snapped up by a group led by Japanese arcade magnate Hayao Nakayama and one of the original four founders, David Rosen (pictured left). A year later, this "new" Sega was purchased by Japanese IT giants CSK Holdings Corporation, whose boss - Isao Okawa - was actually a friend of Rosen. The last American to be involved so closely with the upper echelons of Sega, Rosen would continue on with the company, first as head of Sega of America and then as a Chairman of Sega, until his retirement in 1996.